In 1861, Mr. Busch married Miss Anheuser, and the rest is history. Budweiser became the best-selling beer in the world. By 1905, Lilly and Adolphus Busch had a home on Pasadena’s Orange Grove Avenue, the street that was known as Millionaire’s Row. In 1911, the social event of the season was the Busch’s golden anniversary party. 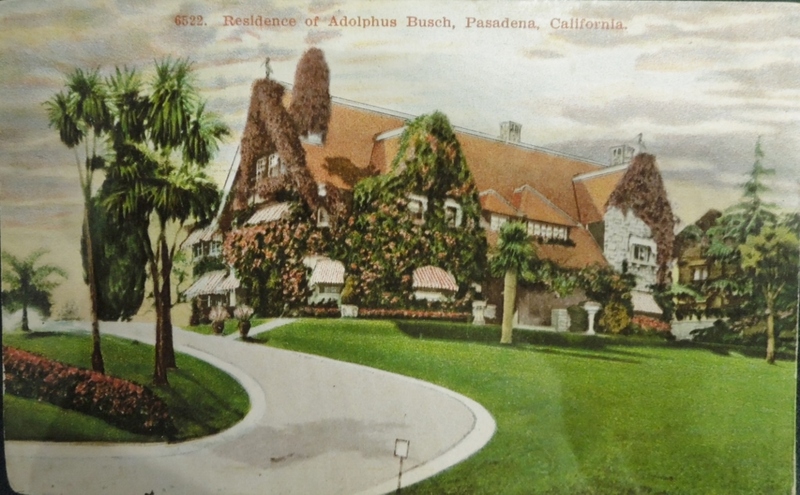 Vintage postcard of the Busch’s Pasadena home, called “Ivy Wall.” The grounds, the original Busch Gardens, were open to the public. At the party celebrating their 50th wedding anniversary, Adolphus Busch presented his wife with a crown and placed it on her head. The newspapers reported the crown cost $200,000. They gave elegant party favors. Each guest received a set of ten wine glasses to take home. I remember seeing the wine glasses at the Pasadena Museum of History. Your photo shows how truly beautiful they are with the gold designs ! When I saw the wine glasses, at first I thought, ‘what lovely wedding gifts’ but no, each guest received ten of these at the anniversary party ! What opulence.The detail on the stems add to their overall elegance. 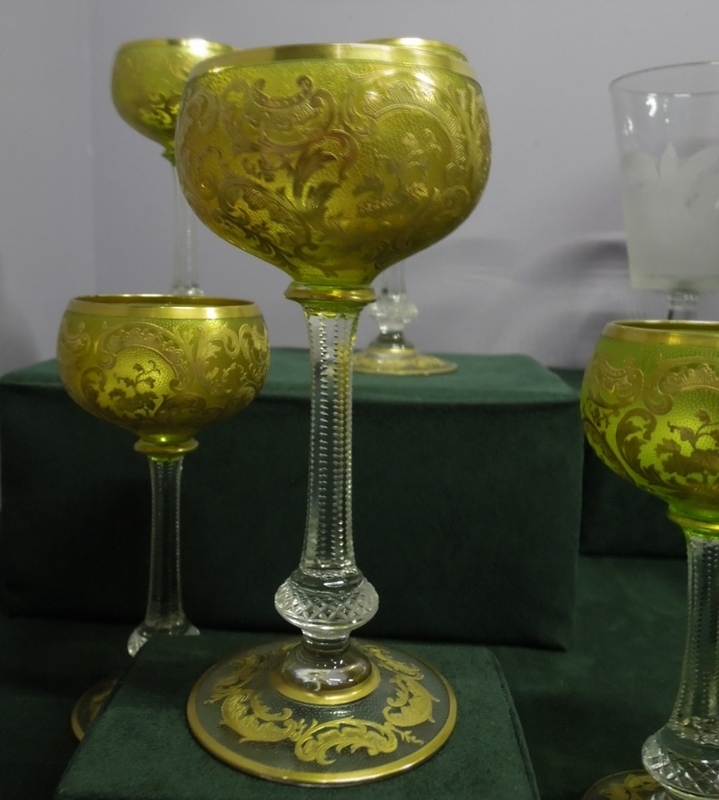 I wonder how many wineglass sets still exist and if the present owners would be surprised to know the history of the sets. Glad you put up the photo. It might lend a lovely story to someone’s great-grandmother’s set of wine glasses that are reposing in the back of the china cupboard like gilded ladies of a byegone age. They don’t make ’em like they used to !!! You’re right, Penny. They don’t make ’em like they used to — the museum has all ten of the glasses given to Mr. Mattison. Not one has broken in the last hundred years. That would be cool if someone discovered that their wine glasses were party favors at this extravagant anniversary party. Pin it, anyone? I wish I had a set, Penny! I have a large ceremonial bier stein that was a gift from my great uncle Adolphus and Lilly to celebrate their 50th anniversary to my great grandfather Carl Conrad and his wife. The Gift was given to them at this party, and the Stein has a Giant A-Eagle on the front—and on the bottom has both families names and the 50th anniversary celebration noted… it was originally done in Gold Leaf. If you would like I can send a nice photo. How nice you have this personalized gift from your family’s famous party. You’ve done a great job describing it, so a photo is optional. Thanks for telling about it. I would like to see the photo.